Team Mental Hai Kya were snapped on a dinner date in Mumbai on March 5, 2018. Kangana Ranaut, Rajkummar Rao and Ekta Kapoor were snapped outside a popular restaurant in Mumbai. The Queen actress was bang on in terms of style and looked trendy in a gorgeous black outfit with thigh high boots. 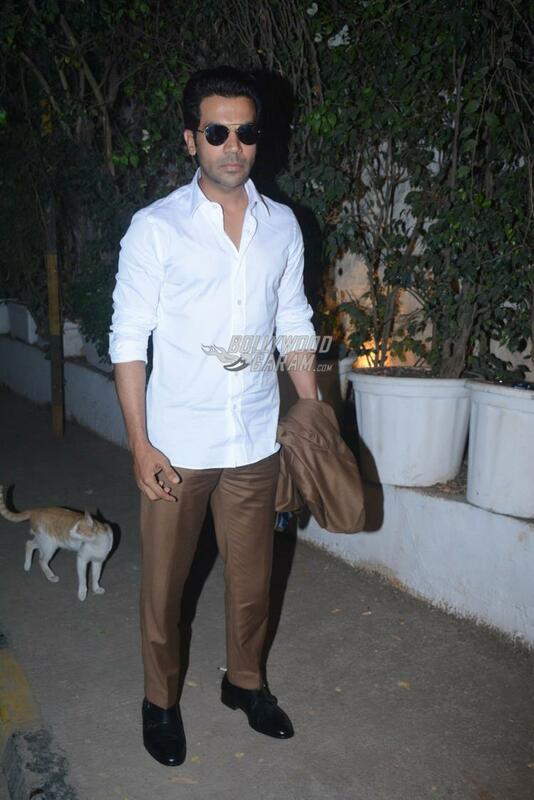 Rajkummar was seen in a white shirt and brown trousers and was seen posing with his co-star Kangana. Kangana completed her look with her hair tied in a bun and dark smokey eyes. Filmmaker and producer too looked pretty in a blue jumpsuit and was seen happily posing with Kangana and Rajkummar. The makers of the film recently shared the first look of Mental Hai Kya which has shown quirky sides of the lead actors Kangana and Rajkummar. Mental Hai Kya is a psychological thriller. Kangana Ranaut in a recent interview talked about the film and said, “My next film is Mental Hai Kya, which is written by a woman screenplay writer, Kanika. The story is about a woman who could be a murderer or a mentally ill person. It talks about mental health, but also has a light-heartedness to it.” The actress is also filming for the upcoming flick Manikarnika – The Queen of Jhansi.